At a time when the people and leaders of the world are looking for unity between church denominations and religions through this ecumenical-interfaith movement, God is calling His people OUT of it. Will you heed the warning? Now the majority of people wrongly identify who Babylon is, and therefore cannot respond to this urgent message to come out of Babylon. If you look at our WHO IS THE WHORE OF BABYLON page, you will see that the 'MOTHER of harlots' is none other than the Roman Catholic Church. But is the pronouncement in Revelation 14:8 and Revelation 18:2 of Babylon now being 'fallen' and 'becoming' the habitation of every foul spirit, a pronouncement of the Roman Catholic Church? No. And I will tell you why. The fact that this call is to a 'body' that is become fallen, means that at some point it was in good standing with God. Yet the Roman Catholic Church has been in an apostate, 'fallen' condition right from the very beginning of the church. So to say that the Roman Catholic Church is 'now fallen' and has 'become' the habitation of devils, is just the same as saying that Paganism, or Hinduism, or any other false religion has 'become fallen'. And that, as we know is not possible, because these false religions have always been the 'habitation of devils'. So this specific end time call for God's people to come out of Babylon, isn't a specific message for the Roman Catholic Church or any other false religion, because the call has always been for people to come out of false religion, and to turn to the one true God. No, this call is a specific call for God's very own people to come out of a 'body' that has BECOME fallen and has BECOME the habitation of every foul spirit. And what 'body' is that? The fallen Protestant churches. As you can see, Revelation 17 reveals that 'MOTHER' Babylon has 'daughters' who will also share in her many sins and plagues. 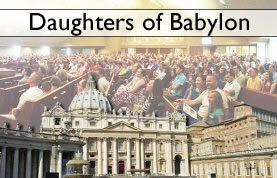 And who are the daughters of Babylon? These can be none other than the churches and institutions which arose from the Roman Catholic Church [the Mother], during the Protestant reformation. The Protestants ran well for a 'season', but ended up fencing themselves about with creeds, causing them to fail in the advancement of light and truth, and have ended up developing a character as that of their 'mother', the Roman Catholic Church. All of the various Protestant denominations have retained in their ecclesiastical organizations, worship and doctrines, relics of popery! Most, if not all of the denominations of today, should be called 'churches of the world', more than churches of God. The desire for power and worldly gain has infected most, if not all of them. They have ended up making a god of this world, and they are no more churches of Christ, than their 'mother', the Roman Catholic Church. Is the condition of the Protestant, now called Evangelical, churches any better than the Jewish church, when Christ uttered the words ... "Woe unto you ... hypocrites"? (Matthew 23). I think not! The prophet Isaiah described the condition of the various churches in the last days when he said ... "And in that day seven women shall take hold of one man, saying, we will eat our own bread, and wear our own apparel: only let us be called by thy name, to take away our reproach." (Isaiah 4:1). The various Protestant/Evangelical churches today have 'taken hold of one man', and call themselves by the name of 'Christian', and yet they 'eat their own bread and wear their own apparel', instead of eating the 'bread from heaven', which is the Word of God, and living by it, they follow after tradition and the teachings of men. They have held on to the false 'sabbath' of Papal Rome (Sunday). They have fully embraced the false trinity god of Rome. They have embraced spiritualism through the false teaching of the 'immortal soul'. They proclaim the devilish teaching that the lost will burn for all eternity! Slowly but surely, the churches have been piling up the sins and abominations, where they have now reached the point of turning back to their 'mother', the Roman Catholic Church and are fully embracing her! No longer are the Protestant (Evangelical) churches proclaiming the truth that the Papal Church is that 'man of sin' and 'antichrist' which the Bible speaks of. No! Instead, they are embracing that mother of abominations in this ecumenical movement we have going on today. Not only that, the Protestant churches today are now making an unholy union with the governments of the world. And this, as we saw with the Jewish church of old, spells disaster! So this message - "come out of her My people", is to the people of the fallen protestant churches. And yes, this message also applies to Catholics, because the call to come out of the Catholic Church has always applied right throughout history, as the Catholic Church has always been in apostasy from it's very beginning. But this specific end time call is for those within the various fallen Protestant denominations which are now 'fallen' and have 'become' the habitations of foul spirits. But notice that God is saying "Come out MY PEOPLE". This means that God has people within the fallen churches who are living up to the light they have received. They are living a true faith according to what they know. And once they see the truth of God's Word, which the priests and pastors of these fallen churches have been hiding from them, then they will come out and join with God's true remnant people who "keep the commandments of God AND the faith of Jesus." PLEASE NOTE: Is this just a message to come out of the fallen churches? Is it enough to just separate from these fallen churches? No, this is also a call to get Babylon OUT OF YOU! Babylon is fallen, because of her unity with the world and committing sinful things. So even if you come out of the fallen churches, but still live for the world and continue to do sinful things, then you will still be part of Babylon. So a COMPLETE conversion is required in our lives! This is part of the call to come out of Babylon. So if the Catholic Church is an apostate church, and the various Protestant churches are 'fallen', who is God's church today? What Church is Giving This Message? This is where one specific Protestant denomination needs to be mentioned. You see, the first 'coming out' of the fallen churches happened in the 1800's, when the advent call was being proclaimed. This was a great movement, ordained of God, where the truth of the 2300 day prophecy of Daniel was coming to light through a preacher called William Miller. 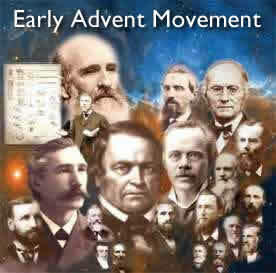 And this movement became the Seventh-day Adventist Church. A 'called out' church that was ordained of God to take the final messages (three angels messages) to a dying world, before the return of Jesus Christ. Now during the early years of this church, it was a faithful church and proclaimed the truth that is found in Jesus Christ. The early Seventh-day Adventist church rejected the false trinity god and proclaimed the truth about the one true God and His Son. She proclaimed the truth about the commandments of God and the faith of Jesus (Rev. 14:12). She also proclaimed the truth about the 'fallen' churches of babylon, and that apostate system of religion, called Roman Catholicism. But sadly, 'wolves' have entered 'not sparing the flock', and the truths which the Seventh-day Adventist Church once lived and proclaimed have now been rejected, in favor of being 'friends' with Babylon and the world. So even though God started this end time church to take the final message to the world and prepare the way for Jesus' second coming. It has fallen into apostasy, and is becoming (if not already) a 'sister to fallen Babylon'. Which means there is no denomination now regarded as God's true church. Instead, it is those faithful few who, as Revelation 14:12 confirms, 'keep the commandments of God and the faith of Jesus'. It is the faithful few who are walking in the light of the early Advent movement of the 1800's - the 'Philadelphia' church. And we would regard ourselves in this ministry, by God's grace, as part of that group - God's true church. Will You Come Out of Her? If you read Revelation 18:4, you will see that Babylon is guilty of many sins and will receive the final wrath of God before Jesus Christ returns which are the 7 last plagues. And anyone who stays in Babylon, whether it be the 'Mother' or the 'daughter' churches, they will also receive of the plagues and be forever lost. So this is a VITAL message to those still in Babylon. Are you a member of Babylon, whether it be the Roman Catholic Church or the fallen Protestant churches? God is calling you out today! Don't settle for half truths from your priest or pastor, study God's Word for yourself and let Christ Jesus light up your life with the whole truth. God is waiting to save you! The churches of the world are saying "LET'S JOIN TOGETHER FOR A COMMON CAUSE", but we say "COME OUT FROM AMONG THEM AND BE YE SEPARATE". Please heed the warning.